Congratulations to Brie, winner of the PlanetWise mini wet/dry bag and medium wetbag combo. A new giveaway will be starting Monday, though, so don’t despair if you didn’t win this time! 1. If you are a current Facebook fan (or just became one), that’s worth one entry per giveaway. (So next week you’ll get credit for being a facebook fan, too, so long as you post under the giveaway blog saying that you’re one). The bonus entry isn’t just for new fans. You need to go back to the original blog giveaway post and do this, or you’re not giving yourself an extra entry. Instead make separate comments for each of those things. 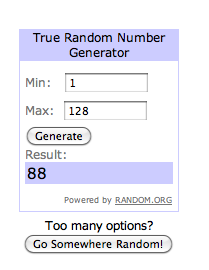 This is because we use a random number generator to choose our winner. I type in the total number of comments/entries, and it will spit out a number for me. That number is our winner. You want the maximum number of entries, don’t you??? By compiling them all in one post, you’re only getting one entry that way. I think I figured out that in an average week of the blog, with one post per day, if a person tweeted the giveaway daily, made comments on each post, and did all the other qualifiers, they would earn 16 total entries into our giveaway. Just remember, the deadline for posts is Friday at 9 p.m. PST (any after that time will not be “approved” and counted as entries). And if you don’t have time to visit the blog daily, that’s okay… my hint is to just set aside time on Friday then, when you could make a comment on each blog post quickly and do all your entries at once. 2010: new business, new blog! Welcome to the Mothering Grace blog! Since opening for business two months ago, I’ve been meaning to start a blog, but got sidetracked by all the other important “getting up and running” things. But finally we’re ready to launch this blog, which I hope you’ll find full of useful info… and of course, we’ll be giving you chances to win exciting products every week! Tuesday: Spotlight Tuesdays… we spotlight a product from our store, a website that we love, another business, whatever. Thursday: diaper questions answered. We pick one diapering-related question to answer. Sunday: day of rest … for you and us! Some other sites out there focus strictly on cloth diapering. While of course I do love diapers, I’m hoping this blog will go beyond just diapering topics. I’m hoping to cover topics in attachment parenting, Christian parenting, natural living, and more… And I really hope that you will all chip in with your thoughts, too! You’ll definitely have incentive, since you’ll be rewarded with extra giveaway entries for weighing in on topics during the week. More to come later, and please come back on Monday as we announce our first giveaway!